Making The Cloud Green: Tech Firms Push For Renewable Energy Sources : All Tech Considered Few people can demand what kind of electricity they get. But Microsoft and Facebook, which operate huge, power-hungry data centers, are trying to green up the electricity grid with their buying power. 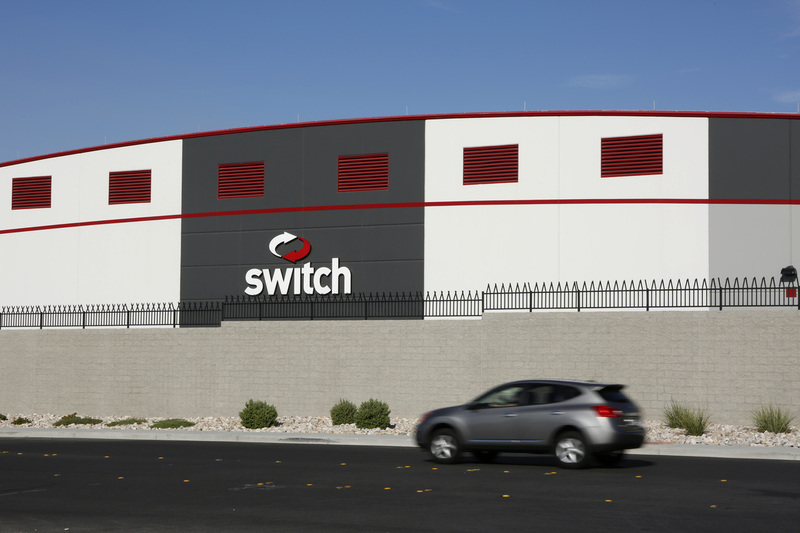 A car drives by a Switch data center in Las Vegas on Sept. 9, 2015. In 2013, data centers consumed 2 percent of all U.S. power — triple what they used in 2000. At Green House Data in Cheyenne, Wyo., energy efficiency is an obsession. When someone enters one of the company's secured data vaults, they're asked to pause in the entryway and stomp their shoes on a clear rubber mat with a sticky, glue-like finish. "Dust is a huge concern of ours," says Art Salazar, the director of operations. That's because dust makes electronics run hotter, which then means using more electricity to cool them down. For data centers, the goal is to use as little electricity as possible, because it's typically companies' biggest expense. In 2013, data centers consumed 2 percent of all U.S. power — triple what they consumed in 2000. Wendy Fox, Green House Data's communications director, says the sector has a responsibility to source that electricity sustainably. The power Green House Data draws from the grid mostly comes from coal. The company offsets that by purchasing green energy credits that support renewable energy development elsewhere. But larger companies are no longer interested in simply buying credits. Instead, they want to get more of their power directly from renewables. "Direct sourcing is important to us because our goal is really the transformation of the electric grid," says Brian Janous, the director of energy for Microsoft, which owns Wyoming's largest data center. Microsoft is teaming up with dozens of other powerful companies, including Facebook and Google, to push for easier access to renewable energy. Janous says they have leverage. "We're going back to our utility every year and saying, 'We're going consume more power next year than we did the year before,' " Janous says. Green House Data used 15 million kilowatt-hours last year, enough to power 1,500 homes. "This is the cloud," Salazar says, standing in front of rows and rows of glass and metal cabinets. The cloud — where you upload photos and stream video — is a real, physical thing. Those cabinets are chock-full of humming electronics and colorful cables, all fed by enormous black power lines, snaking along the ceiling of the room. And they consume an enormous amount of electricity. "The electrical resources of the planet are finite, but our need for data seems to be infinite," Fox says. A recent study from the Lawrence Berkeley National Lab suggests that electricity consumption growth is slowing, but even so, data companies are much larger consumers of electricity today than they were in the past. Janous says that puts tech companies in a unique negotiating position with utilities, and with the states that want to attract their business. "We want to influence policy, we want to influence the availability of these resources," he says. In Nevada, a data company was able to convince the utility NV Energy to build new renewable capacity for its project. In Virginia, Microsoft has negotiated an agreement for a new solar farm. Microsoft has already invested around $1 billion in data centers in Wyoming. Shawn Reese of the Wyoming Business Council hopes that's just the beginning. "We want Microsoft to continue to grow here and, frankly, we want some of their competitors to be here in the state of Wyoming as well," he says. But Wyoming doesn't have a lot of renewable energy available. Reese says that needs to change — or the state will risk losing out on business from one of the nation's fastest growing sectors. "The markets are changing," he says. "The technologies are changing and the state's got to keep up with those."